Please detail your years of military service. After I joined the Army in September 2002, I began with basic training at Fort Leonard Wood and then went on to Fort Bragg for advanced training. In 2004, I trained at Fort Irwin, the National Mobilization Training Center. I also did Joint Readiness training at Fort Polk in 2005 and that year received my highest rank of SGT on Nov. 1,2005. During my service I received the Combat Action Badge and the Army Commendation Medal. While in Iraq I served as a Psychological Operations Team Chief. I finished my Army Reserve career stateside as the NCO in charge of the Product Development Detachment and left the service in 2011. From a personal standpoint, what were those years like? My military experience shaped me from the time I joined in 2002, at 18 years old, until I got out of the service in 2011. It has enveloped every aspect of my life; the quintessential moments of my life came out of this period. I saw things and felt things I never would have imagined and could not have imagined. The military became a filter for me with respect to how I viewed the world in my early adult years. Even today, everything gets filtered through the person I proved I could be while serving my country along with fellow soldiers in combat. 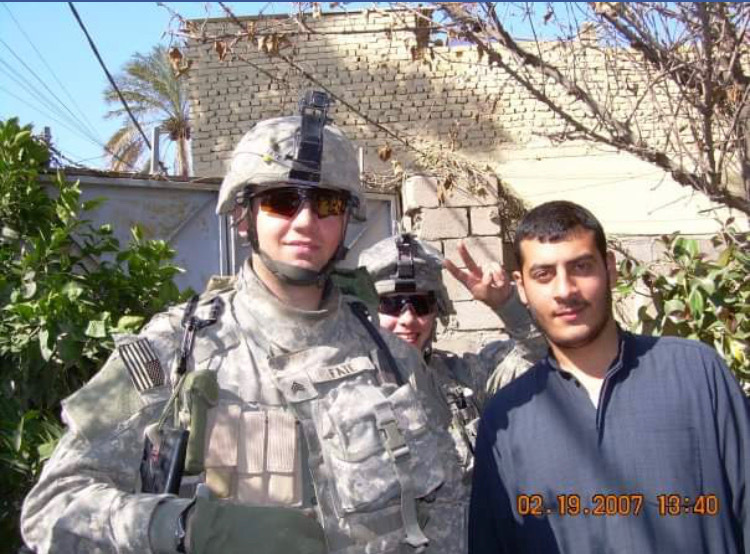 My military experience showed me loss of many kinds; it brought me the first loss on a deeper level than I had ever experienced with the soldiers I served alongside. 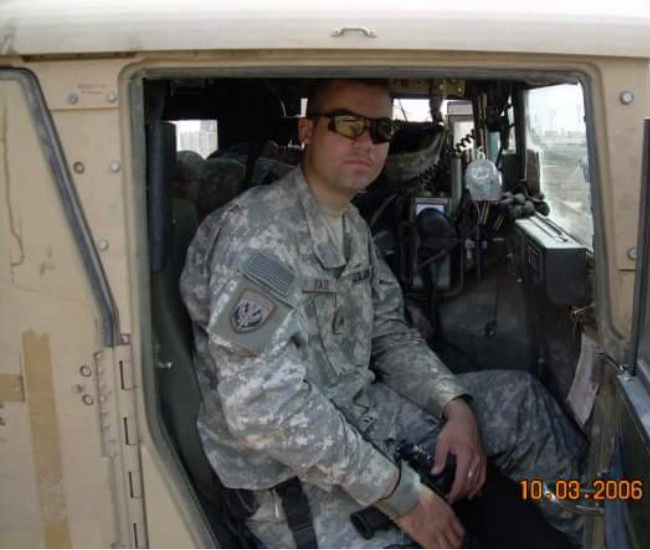 We lost SGT Tommy Vandling, the one and only soldier from our company’s history to die in combat. However, I joined the military with the desire to serve on the front lines no matter what. I would also add that my military experience taught me that teamwork never ends. I stayed in close contact with those I served with because our shared experience could not be replicated anywhere else. Beyond that I also learned to appreciate the shared experience of the millions of Veterans who are out there. This taught me that in volunteering my time, and getting to know other Veterans in the process, it could make my military experience come alive again in best sense. What has been your experience collaborating with other Veterans in the program? Without being connected to OVArts and the Veteran Design Team activities, I never would have had the opportunity to meet so many other Veterans and work closely with them. The experience has enriched my engagement with the Pittsburgh Veteran community and also helped me in networking. When OVArts was looking for office and training space, Allyson Holtz and I met with Veteran Ben Stahl, Executive Director of the Veteran Leadership Program of Western Pennsylvania (VLP). I believe this connection with Ben helped me when I later applied for and obtained a VLP position. After leaving the service, what made you decide to volunteer with Operation Valor Arts? I was first introduced to Operation Valor Arts through Amos Behana, a Veteran who served with me in Iraq in 2006. We were both with the 303rd Psyop Division headquartered at the McGarity Army Reserve Center in Moon, PA. Amos introduced me to Allyson Holtz, the Co-founder of the organization. I was immediately excited about the opportunity to serve fellow Veterans in a meaningful way with regard to commemorating the service and sacrifice of all service men and women but especially those who paid the ultimate sacrifice. It was always important for me to find an avenue to give back to the families of the fallen and OVArts has given me that opportunity. In what ways have you participated with OVArts? I attended OVArts fundraising events both in 2015 and 2016. Once I began to work with the McGarity Army Reserve Project Veteran Design Team, I was designated Design Team liaison to the Board of Directors. In 2017, I was elected to serve on the Board. One goal of the organization is to engage experienced Design Team members in assisting new Teams. I will be involved with the Forest Hills Veteran Housing Project which is now just getting off the ground. I have gained so much valuable non-profit organization knowledge from my roles with OVArts. In the future, what do you think will be your long lasting take-away from this experience? My lasting takeaway from OVArts is directly related to our art projects. With the projects I help design I will have a tangible piece of Veteran history to always look to at as something that empowered and uplifted me. It’s difficult to articulate, but my collaboration with the Design Teams and watching the projects progress, helps me process the thoughts and feelings that had nowhere to go. OVArts also proves to me the power of teamwork and how Veterans using their experiences as inspiration is a true work of art in and of itself. The depth and breadth of these experiences are so great and varied that our total creative process resonates with power and strength. Despite that OVArts is a non-therapy based program, I believe it will save Veterans’ lives by way of allowing them to heal. They will remember how their journey is one rarely trekked; the projects will be a reminder of their power to heal and to reflect on their strengths. Our projects are large-scale; a reminder that together Veterans can accomplish anything and lift each other up in a way that keeps them aspiring for greater excellence in life. All Veterans deserve this chance to re-write their own history. It has given me the ability to transform my own experiences into art by adapting it into a language that only other Veterans can speak of and approve, Although OVArts creates interpretive public art and not memorials per se, I believe what we do create is sacred. It is art that has the potential to last forever with its own power and beauty. The experiences being imbued in the art are a reflection of those suffered in combat. We must be the voices of those Veterans who were not able to bring their experiences home themselves. Any other ways in which the program has enriched you? The OVArts program has greatly enriched me in regard to giving me that sense of purpose that had been missing since I left the Army. In the wake of no longer having larger than life military missions, my commitment to OVArts activated a part of me that has been dormant since I left the service. You work with Veterans on a day-to-day basis. Has your OVArts experience influenced your interaction with them? 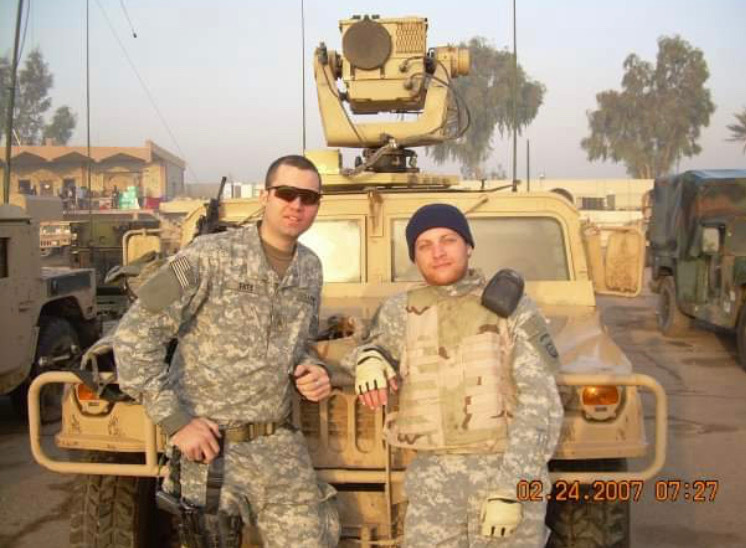 Yes, my experience with OVArts has taught me that as Veterans we are only one connection away from making a big impact on our community. All It takes is the courage to step out of our comfort zone and attempt to do great things. I firmly believe that Veterans have a voice that is often left to fall on deaf ears, OVArts gives Veterans a voice in a non-political and organic way. I get the feeling that I am engaging in history- making and impacting change. It’s a total win-win scenario. I would recommend the organization to any Veteran who is ready to put their best foot forward and fully invest themselves. Working with OVArts has greatly increased my confidence in that my voice and my perspective matter. The sky’s the limit with this organization.